Times are getting rather interesting for Mr. Barmes. 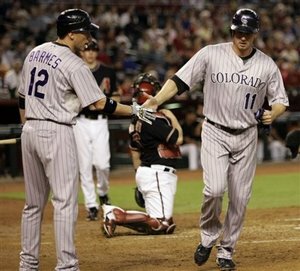 With Brad Hawpe very likely to return right at or around schedule from the 15-day DL, I would say Barmes has roughly 10 days to get on track, or the Rockies will have to make a really tough evaluation of their roster. Where does Barmes fit in? A lot of that depends on what Barmes does with the playing time he receives between now and then. It also has a lot to do with how much Jim Tracy falls in love with EY Jr. leading off, and CarGo hitting behind Tulo. With the spark each has provided early in their experiments, I would say both are sticking there for a bit.